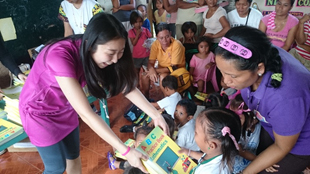 Lapu-lapu City, Cebu – Just in time for the opening of school year, KPGroup Philippines, Inc. donated complete set of books to San Vicente Day Care in Olango Island, Lapulapu City, Cebu on July 10, 2015. 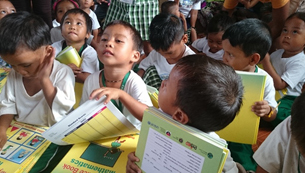 For this school year, 54 children were enlisted in the day care center and each of them received a complete set of books. During the distribution of books, Jean Calapuan told the story of The Turtle and the Rabbit to the children and emphasized the moral lesson of the story. Also present during the book donation are Eri Takahashi, Yuki Endo and Abner Barnuevo. Snacks were also distributed during the activity. The teacher and the parents were very happy and grateful once again to KPGroup for the continued support extended to the school and to the residents of Brgy. San Vicente. On July 25, 2015 Participants from different branches of Kane Package Group of Companies joint effort in planting mangroves in the coast line of Brgy. Polo, Tanjay, Negros OrientaL. A total of 19 representatives were involved in mangrove planting. 3 from KPPI, 3 from SFLI, 2 from KPTH, 2 from KPVN, 1 from KPHK, 1 from KPI, 2 from KPJP, 3 from KPG, and 2 guests from Japan. Upon the arrival of participants from Manila to Sibulan National Airport they were welcomed by KPGreen Earth coordinators. They headed straight to the planting site in Brgy. Polo, Tanjay. A 40-minute ride from Sibulan Airport to Tanjay, Negros. This is the second mangrove planting activity conducted in Tanjay, Negros. Last March 2014, planting activity was done at Brgy. Manipis, Tanjay, Negors. Local officials and DENR R7 were also present during the short program conducted before the planting has started. 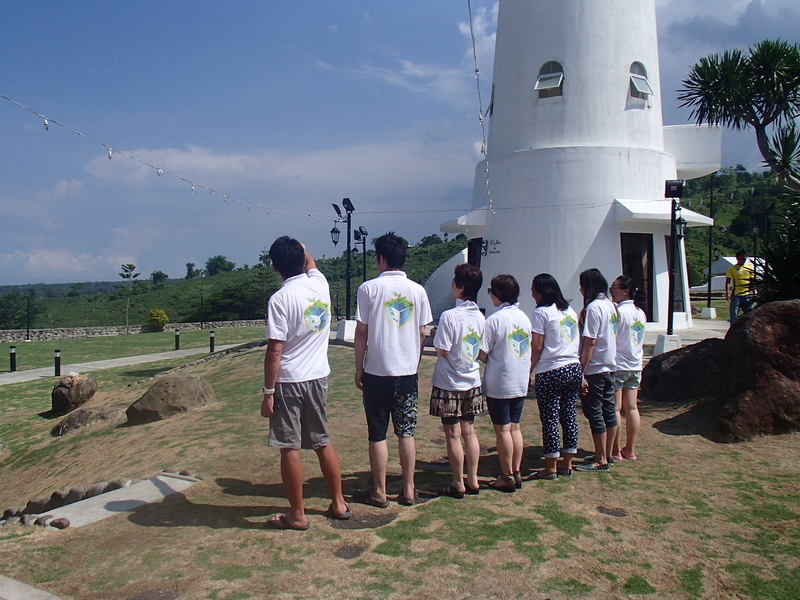 A total number of 300 seedlings of Avicennia marina were planted by the participants during the said planting activity. Likewise, the community of Brgy. Polo also took part in planting mangroves to obtain participation in taking care of planted mangroves. The importance of this mangrove planting activity is to restore the balance in nature as well as to create awareness among the local people of the benefits that the mangroves have to offer. 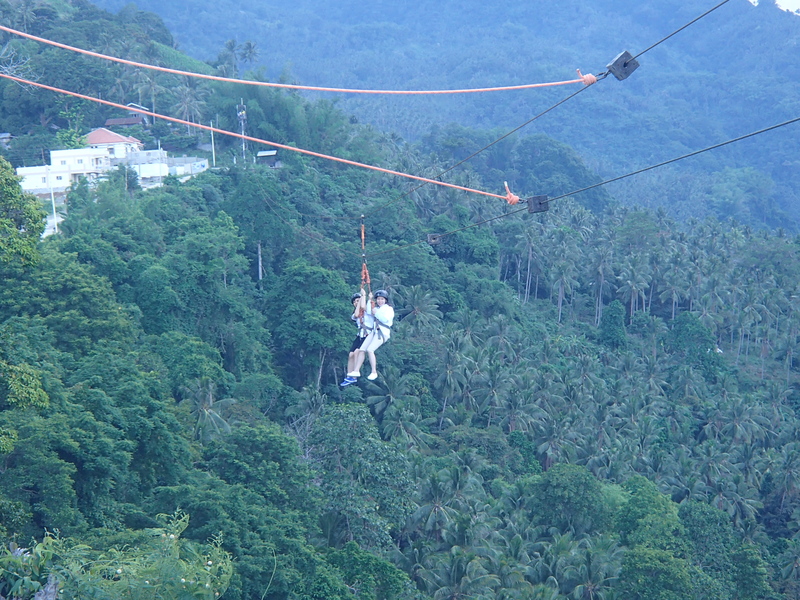 Participants and guests also delighted the view and went zip lining in Tierra Alta Residential Resort in Dumaguete. 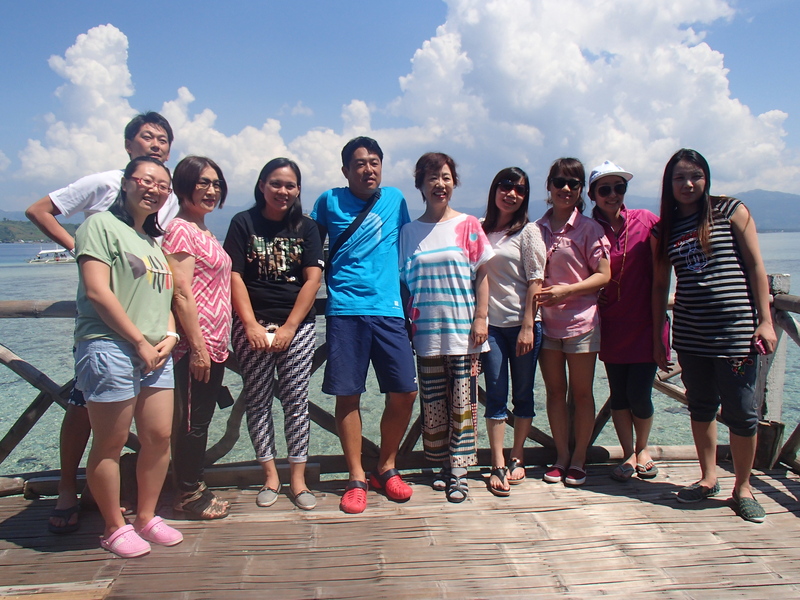 They even got the chance to visit and enjoy swimming in the popular white sand bar of Manjuyod closely associated to Bais City organized by the Bais City Tourism Council. 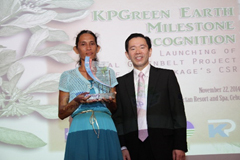 LAPU-LAPU CITY, Cebu – Serious on its commitment to help in protecting the environment, the Kanepackage Group (KPG) through its Corporate Social Responsibility (CSR) KPGreen Earth launched its new five years project from 2014-2019 dubbed as Coastal Greenbelt Project last November 22, 2014 at Shangri-La Mactan Resort and Spa, this city. Coastal Greenbelt Project is an offshoot of the success of the KPGreen Earth’s CSR which succeeded in planting of five million mangroves in five years. The project did not only help in protecting the environment but also provided additional income to the involved communities. Meanwhile, this new undertaking sees that in the next five years the company shall further improve its rehabilitation efforts on mangrove and beach forests as it also seeks to strengthen the sustainability of coastal development, educate the employees/customers the importance of mangroves and its conservation, give alternative livelihood to the community and promote environmental awareness among the company’s constituents and stakeholders within the sphere of influence. Like the previous project, the Coastal Greenbelt Project will also underscore community partnership by replanting the degraded areas of mangrove and beach forest within five years in the selected coastal areas of Cebu, Bohol and Negros Oriental provinces. Specific objectives of the Coastal Greenbelt Project include awareness of the employees/customers on the significance and importance of mangroves, its conservation and protection through outdoor learning and mangrove planting activities in collaboration with the Department of Environment and Natural Resources. LAPU-LAPU CITY, Cebu – The Kanepackage Group of Companies (KPGroup), a Japanese firm committed in protecting the environment particularly coastal areas has successfully achieved planting about 5.8 million mangroves in a span of five years covering 162 hectares with a survival rate of over 87 percent. Said undertaking is in line with company’s KPGreen Earth Corporate Social Responsibility (CSR) program launched last 2009 with planting sites in Olango Island (Cebu), Banacon Island (Bohol) and Barangay Manipis in Tanjay City, Negros Oriental. KPGreen Earth has partnered with the Department of Environment and Natural Resources (DENR), concerned local government units (LGUs) and different People’s Organization (POs) for the conduct of mangrove rehabilitation and its protection and management. 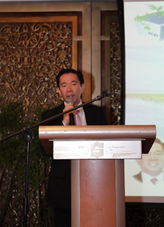 In celebration of this momentous milestone, KPGroup recognized its partners last November 22, 2014 at Shangri-La Mactan Resort and Spa in Lapu-lapu City, Cebu. The partner local people were awarded with plaque of recognition for their valuable support in the implementation of the mangrove project. They were the Olango Island Eco-Tours Association (Olango Island), Banacon Fisherfolks and Mangrove Planters Association (Banacon Island), and Manipis Fisherfolks Association (Tanjay City, Negros Oriental). The event was attended by the company’s top officials headed by its President and CEO Mr. Yoshikazu Kanesaka and Chairman Mr. Sakutaro Kanehira together with representatives from Thailand, Japan, Vietnam, Indonesia and the Philippines. 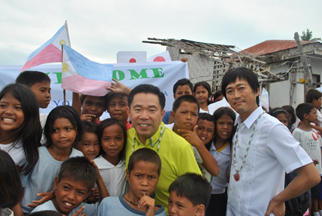 Also present in the ceremony were Saitama Prefecture officials, Saitama University Professor, DENR Regional Technical Director Dr. Al Orolfo, Getafe, Bohol Mayor Hon. Casey Shaun Camacho and the local people who were the partners and beneficiaries of the CSR project. 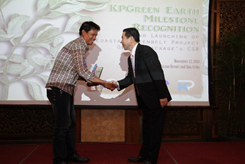 KPGroup believed that KPGreen Earth has been very relevant given the challenges on climate change and severe mangrove degradation in the past decades arising from culture pond conversion and several other anthropogenic activities. 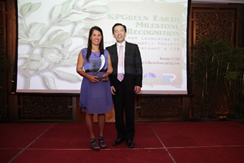 KPGreen Earth is also the company’s answer to the call of the government to help in protecting the environment. DENR-7 Regional Executive Director Dr. Isabelo Montejo during this year’s Environment Month Celebration last June reiterated that the government has been making more efforts in order to mitigate the impacts of climate change through the national greening program (NGP), massive mangrove planting and growing activities, geohazards mapping and assessment, biodiversity conservation but underscored that much more needs are to be done with help of other stakeholders. Montejo said Kanepackage Group has been consistently supportive in protecting and rehabilitating the mangroves as they absorb and dissipate the energy of the waves. “The exceptional contribution of KPGroup in mangrove rehabilitation and restoration has helped in preventing coastal erosion and damaging structures thus making our communities in the coastlines safer,” he added. After the ceremony, Kanepackage affiliates and partners went to Olango Island for the mangrove planting as a manifestation of its strong support and commitment to the CSR project. 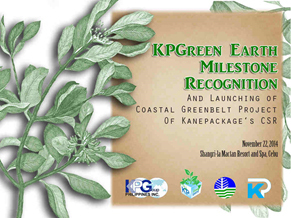 KPGreen Earth Project Milestone Recognition and Launching of Coastal Greenbelt Project of Kanepackage’s CSR in support to the rehabilitation, protection and management programs on mangroves and beach forests in the Philippines. We already achieved our 5 million mangroves for 5 years goal that started in 2009. In the same event we will also launch our new project on coastal greenbelt, coastal livelihood and disaster risk management initiatives. The event will be held in Shangri-La Mactan Resort and Spa, Lapu-lapu City, Cebu on November 22, 2014 at 10:00am. 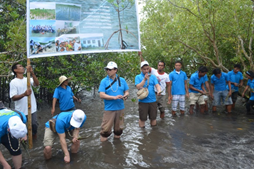 Negros Oriental – The KPGroup Philippines, Inc. (KPG) successfully concluded the phase 12 mangrove planting in Barangay Manipis, Tanjay City, Negros Oriental on March 21, 2014. This activity marked the expansion and presence of KPG’s Corporate Social Responsibility “KPGreen Earth” in Negros Oriental which is streamlined to mangrove rehabilitation and conservation. This mangrove planting is part of KPG’s CSR program held semi-annually as a renewal of the company’s commitment and to strengthen its support to the triple bottom line for sustainable development. This is already the 12th phase mangrove planting wherein representatives from respective Kanepackage (KP) affiliate companies from Japan, Thailand, Vietnam, Indonesia, and Philippines joined the planting of mangroves. Additionally, customers and partners from Japan were also present. The KPG management recognizes that environmental conservation and protection is not only a sole responsibility of the government but a shared responsibility with business sectors and private entities. Prior to the mangrove planting, there was a short program attended by different offices coming from the Provincial Environment and Natural Resources Office, Local Government Unit (LGU) of Tanjay City, and the partner Peoples Organization (PO) – Manipis Fisherfolks Association. All barangay officials were present as well as the members of PO signifying their full support to the CSR project. Though tired for the long day activity, the physical exhaustion of the participants was lightened up seeing the smiles and the warm welcome of the local people. The participants were very happy for the experience they have had in planting mangroves, reflecting on what they accomplished in helping the rehabilitation of the coastal resources particularly mangroves. 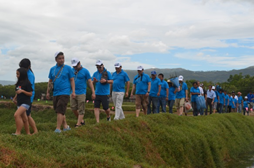 The following day, they had the chance to explore some sightseeing spots in Negros Oriental before returning to their respective country of origin and offices. The number of mangroves planted during that kick off activity accounted to five thousand propagules. Since 2009, total mangroves planted of KPG through the KPGreen Earth CSR is around 4.8 million mangroves covering an estimated area of 136 hectares with sites from Cebu, Bohol and Negros Oriental. 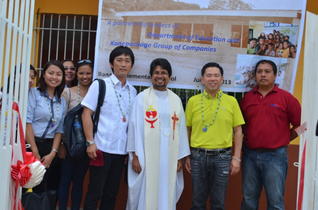 GETAFE, Bohol – Just in time for the opening of the school year, the Kanepackage Group (KPG) in partnership with the Department of Education (DepEd) turned over the two-classroom building in Banacon Elementary School in Banacon, Getafe, Bohol last June 13, 2013. 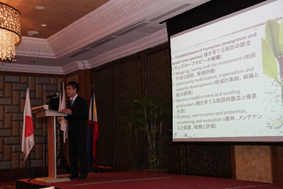 During the ceremony, KPG CEO Mr. Yoshikazu Kanesaka and Kanepackage Philippines, Inc. (KPPI) President Mr. Hirotaka Kanehira were present together with representatives from KPPI, Super Flex Logistics, Inc. and KPGroup Philippines, Inc. The Mayor elect of Getafe Mr. Casey Shaun Camacho and the outgoing Mayor, Hon. Cary Camacho graced the program. This undertaking of KPG with the DepEd is an additional feature to the company’s Corporate Social Responsibility (CSR) “KPGreen Earth” which is a streamlined program for mangrove rehabilitation and management with sites in Cebu and Bohol. The KPG management is thankful to the residents of Banacon who have been actively involved in helping the mangrove project. From its launching in 2009, it has already planted almost 4 million mangroves with the help of the local people and the host community. Kanepackage (KP) is a Japanese firm with offices in the Philippines and overseas including Vietnam, Thailand, China, Indonesia, and Japan as the main branch. As a corporate citizen, the company set aside a portion of the profit in supporting the environmental and social projects. The new classroom is going to help the DepEd realize its plan to have more classrooms in the country in line with implementation of the K +12 program which requires children as early as 5 years old to enrol in a standardized curriculum. The said two-classroom building will be utilized by the kindergarten and grade 2 classes.